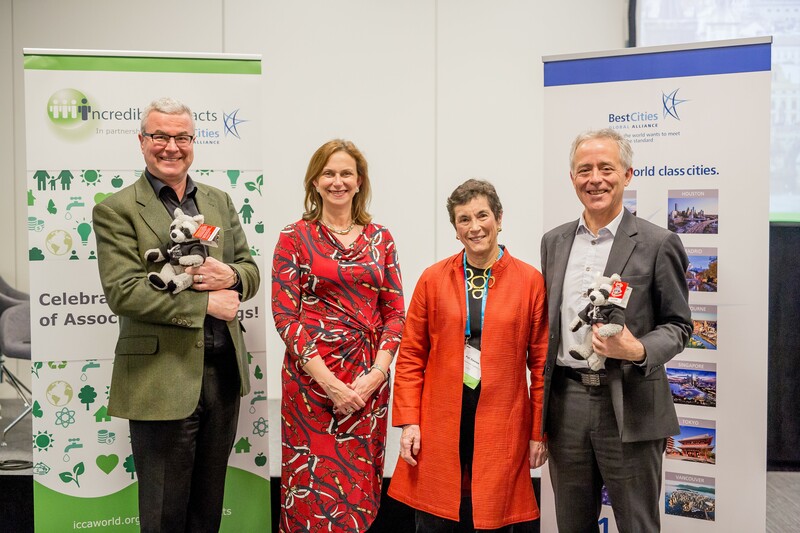 In its inaugural year, the Incredible Impacts Programme, collaboratively supported by ICCA and BestCities Global Alliance, has selected three winning associations as leading examples of excellence within the meeting industry. The winners were announced at the ICCA Congress in Prague, Czech Republic. The three associations from across the globe will each receive US $7,500 towards future projects, in recognition of their hosted events going “beyond tourism” in areas such as legacy development, sustainability and accessibility. Showcasing a diverse range of events, the successful associations demonstrated a unique and well-thought-out approach to ensure their events made a difference beyond what was happening within their venue walls. Thanks to the Incredible Impacts Grant Programme, it is hoped the winners’ good practice will be a source of reference and inspiration for other event planners worldwide. Placing a global spotlight on the often overlooked and misunderstood condition of thrombosis, the ISTH’s World Thrombosis Day campaign organised more than 8,200 events across the globe in 2016. The team demonstrated creative thinking in a number of ways, reaching beyond tourism, with one standout example being their annual Twitter Chat digital event. By creating a platform for people to talk about the condition, sharing expert advice and insights, the project garnered an impressive 45 million impressions worldwide. A unique global forum that opens dialogue on the latest scientific discoveries and medical pioneers relating to Parkinson’s Disease, the WPC describes their four-day congress as a ‘Parkinson Festival’. Judges were particularly impressed with their “Patients Included” element of the programme, through which people with Parkinson’s become part of the discussion and decision-making process. From covering travel costs for attending patients to free webcasts of their educational programmes being made available to communities worldwide, judges commended WPC on their fresh approach to inclusivity and accessibility. The final winner, WCPT is the largest global gathering of physical therapists where the latest research, practice, education and professional issues are shared in a bid to make positive change to global health. The association places a large focus on creating knowledge transfer opportunities with its attending and non-attending audiences, via their effective use of social media and by sharing outcomes from the congress proceedings free of charge post event. The legacy of WCPT’s conference is the result of a number of activities: public outreach activities, fund raising for pubic engagement in physical activity, a school competition getting pupils to create movement break videos and the “Gift of Congress”, supporting delegates from low resource countries. In addition to the three main grants, a student bursary was also awarded to Tamirez Viera Marques from Brazil through the WYSE Travel Confederation Volunteer Award entry. She received a US J-1 trainee visa and an Australia working holiday visa and will receive airfare and a monthly stipend while participating in the programmes. Tamirez was selected for the Dr. Taleb Rifai Outstanding Volunteer Award due to her exceptional contributions as a volunteer for the 2017 World Youth and Student Travel Conference (WYSTC) in Montreal. She plans to research and promote teacher exchange programmes in Australia and Canada. Paul Vallee, Managing Director of BestCities said: “Given this is Year One of the Incredible Impacts Programme, the standard of entries truly surpassed our expectations. Our winning associations should be congratulated on not only winning the grants, but also being an advocate and leader in the meeting industry." “We hope the Incredible Impacts Grant has helped shine a light on ways associations can incorporate innovative thinking and good practice into their future events, demonstrating the sometimes simple ways that this can be successfully achieved. Incredible Impact funds are held in trust and released directly to grant recipients by Meeting Escrow Inc., an independent provider of secure payment and escrow solutions for the meetings industry worldwide. Grant Snider, Meeting Escrow President & CEO commented: “We are delighted to partner with ICCA and Best Cities on this important initiative as a supporting sponsor through 2019. Congratulations to all of this year’s grant winners!" Download the picture in high resolution. BestCities Global Alliance is an international network of 12 leading convention destinations around the globe. They are distinguished by the commitment of the members' convention offices to offering special standards of service. Members include Berlin, Bogotá, Cape Town, Copenhagen, Dubai, Edinburgh, Houston, Madrid, Melbourne, Singapore, Tokyo and Vancouver.